Yamuna Expressway Project between Greater Noida and Agra, the longest Access Controlled six lane (extendable to eight lanes) concrete pavement expressway was conceived by Government of Uttar Pradesh in the year 2001. To accomplish this project, Taj Expressway Authority (TEA), a statutory body of the Govt. of Uttar Pradesh (GOUP) was constituted on 20 April, 2001. TEA is now known as Yamuna Expressway Authority (YEA). (a) To provide a fast moving corridor to minimize the travel time from Delhi to Agra. (c) To open up avenue for industrial and urban development of the region and provide the base for convergence to tourism and other allied industries. (d) To relieve traffic congestion on National Highway -2 (NH-2). 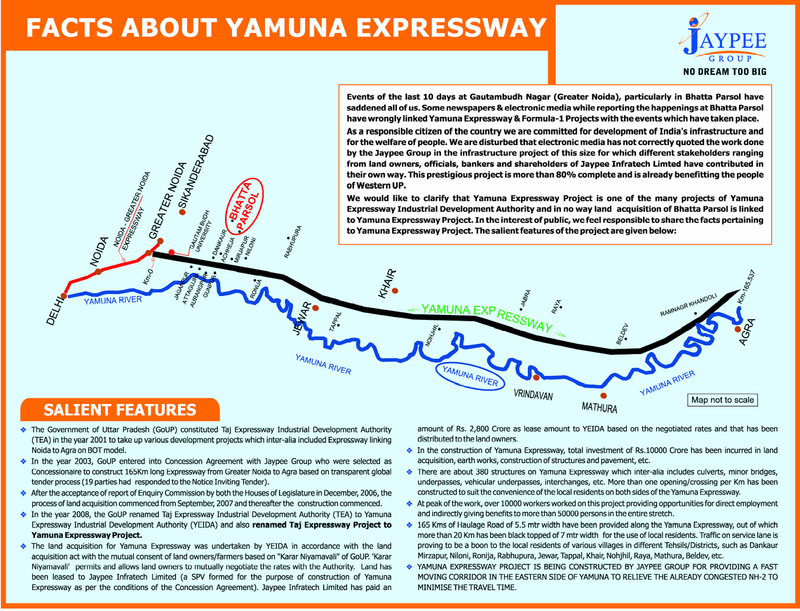 The 165 Km long Yamuna Expressway has been developed by the Jaypee Group under Public-Private – Partnership. The Concession Agreement between TEA and JIL (Jaiprakash Industries Limited) as the Concessionaire was executed on 7th Feb, 2003. 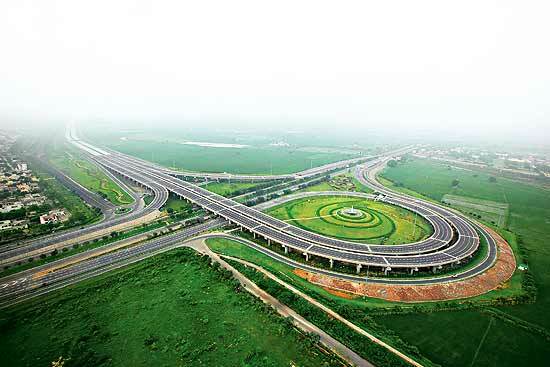 The Yamuna Expressway Project, was formally inaugurated on 09 Aug, 2012 by the Uttar Pradesh Chief Minister Mr Akhilesh Yadav and thrown open to the public. The total project cost is approx Rs 13000 crores.The concession period is 36 years. The Expressway cuts in half the travel time from New Delhi to Agra, the city that is home to India’s top tourist attraction, the Taj Mahal. Apart from providing a fast travel corridor between New Delhi and Agra, the Expressway opens up avenue for industrial and urban development of the region. The Yamuna Expressway corridor is bound to have huge impact on the economic and industrial growth not only of Uttar Pradesh but adjoining states e.g. Rajasthan, Madhya Pradesh and Haryana in the coming years. The Yamuna Expressway Project is conceived with the idea to not only reduce the travel time between New Delhi and Agra but also to open up avenue for Industrial and Urban development of the region and provide the base for convergence to tourism and other allied industries. The Yamuna Expressway Project road passes through virgin land by the side of River Yamuna which is comparatively thinly populated, there being no problem of rehabilitation. Hence least disturbance will take place to the local population. The Project road connects two important destinations of National and International importance and high potential to generate traffic and economic development - National Capital Delhi and tourist center Agra.